King Hezekiah was one of Judah’s best kings. He restored the worship of God to his nation after his father Ahaz’s evil reign. 2 Kings 18:3-4, And he did what was right in the sight of the Lord, according to all that his father David had done. 4 He removed the high places and broke the sacred pillars, cut down the wooden image and broke in pieces the bronze serpent that Moses had made; for until those days the children of Israel burned incense to it, and called it Nehushtan. Yet, when the Assyrian king attacked Judah, Hezekiah surrendered to the king and stripped off the gold from the temple in Jerusalem to pacify him. 2 Kings 18:13-16, And in the fourteenth year of King Hezekiah, Sennacherib (sen-na-chair-ub), king of Assyria came up against all the fortified cities of Judah and took them. 14 Then Hezekiah king of Judah sent to the king of Assyria at Lachish, saying, “I have done wrong; turn away from me; whatever you impose on me I will pay.” And the king of Assyria assessed Hezekiah king of Judah three hundred talents of silver and thirty talents of gold. 15 So Hezekiah gave him all the silver that was found in the house of the Lord and in the treasuries of the king’s house. 16 At that time Hezekiah stripped the gold from the doors of the temple of the Lord, and from the pillars which Hezekiah king of Judah had overlaid, and gave it to the king of Assyria. I think sometimes we may think it is easier just to take care of a problem ourselves (especially if we have the means) just to be done with it. Because his father had already paid him, for some reason King Hezekiah thought he was under some obligation to appease this king and paid him off rather than go to battle. When Hezekiah prayed, God answered him in a remarkable way and delivered him from his enemies. 2 Kings 19:35-37, And it came to pass on a certain night that the angel of the Lord went out, and killed in the camp of the Assyrians one hundred and eighty-five thousand; and when people arose early in the morning, there were the corpses—all dead. 36 So Sennacherib king of Assyria departed and went away, returned home, and remained at Nineveh. 37 Now it came to pass, as he was worshiping in the temple of Nisroch his god, that his sons Adrammelech and Sharezer struck him down with the sword; and they escaped into the land of Ararat. Then Esarhaddon his son reigned in his place. Talk about a Godfather type fear, you thought waking up with a horse head in your bed was scary! This fear was so great that even the King’s children lost faith in his rule and killed him. You may be facing a problem that leaves you feeling helpless. It may be the loss of a job, a difficult family or work situation, or health struggles. We have a powerful God to whom we can bring our concerns. 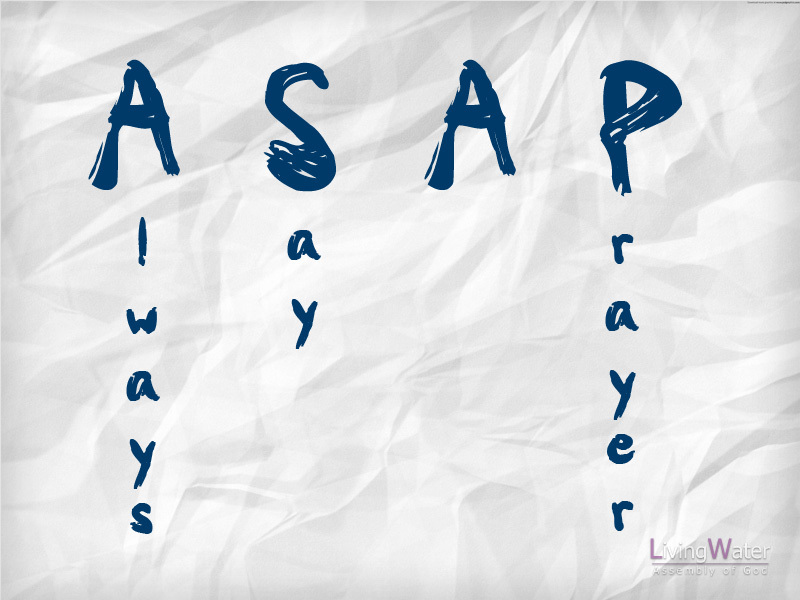 So before we do anything else, we should remember to ASAP—Always Say A Prayer. Prayer should be our first response rather than our last resort. Throughout the Book of Acts we read how the early church’s response when persecutors tried to shut down the Christian movement —they went to prayer! The things that threaten to suffocate or destroy the church—or even us, can turn out to be the means of its preservation and advancement. The result of their prayers were great grace and boldness—great power and unity. Acts 4:31-33, And when they had prayed, the place where they were assembled together was shaken; and they were all filled with the Holy Spirit, and they spoke the word of God with boldness. 32 Now the multitude of those who believed were of one heart and one soul; neither did anyone say that any of the things he possessed was his own, but they had all things in common. 33 And with great power the apostles gave witness to the resurrection of the Lord Jesus. And great grace was upon them all. Prayer helps us to learn the pathway to the reality of our faith, not debate or argument, but prayer. Philippians 4:6-7, Be anxious for nothing, but in everything by prayer and supplication, with thanksgiving, let your requests be made known to God; 7 and the peace of God, which surpasses all understanding, will guard your hearts and minds through Christ Jesus. The largest wings ever known cannot lift a bird one inch upward unless they are used. We must use our wings, or they avail us nothing. We must spread our wings and rise up to the heavenly places in Christ, from these high places we shall see things through the eyes of Christ, things will lose their power to harm or distress us, and earth will be glorified in heavenly vision. Perspective changes in prayer, so pray.